Single-Use Technologies in Bioprocessing: How Far Can They Go? | Technology Networks Single-Use Bioprocessing: How Far Can it Go? Single-Use Bioprocessing: How Far Can it Go? The impact of single-use or “disposable” equipment in the manufacture of vaccines and therapeutic proteins has been indelible and wide-ranging. Strictly speaking, single-use bioprocessing (SUB) refers to vessels, conduits and active consumables that come into contact with process fluids once and are then discarded. In its purest sense SUB replaces stainless steel or glass with plastic. In practice, the single-use philosophy has come to incorporate some products that come in fully-usable form or that bioprocessors employ for several runs instead of just one. “Most of the progress in single-use biomanufacturing, the fullest adoption, has clearly been upstream,” notes Ron Rader, Senior Director, Technical Research at BioPlan Associates (Rockville, MD). “Except for large microbial fermentations and at scales in excess of 2,000 liters upstream processing can be accomplished entirely with single-use equipment, and with many choices among different technologies, bioreactor designs and vendors too. But downstream purification still has many gaps where single-use equipment is not suitable or optimal." “The unit processes that are continuing to stall the most in terms of lagging adoption of single-use systems are fill and finish operations. Hardly any of the complex hardware used for biopharmaceutical fill-finish is single-use, and it is possible that disposable fill-finish equipment, even if limited only to product contact surfaces, may never be practical. If anything, the machinery used for fill-finish, such as newer one-step aseptic blow-fill-sealing, is becoming more high-tech and mechanically complex." The compact X500B QTOF system from SCIEX will simplify your standard characterization workflows with intuitive SCIEX OS and BioPharmaView™ Software, so even novice mass spec users can run intact mass and peptide mapping analyses quickly and easily. You'll get answers to your characterization and comparability questions fast, and you'll free up your advanced instrumentation and mass spec experts for more complex workflows. 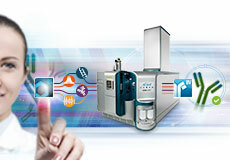 "Mass spec users asked for a system that is purpose built for their application, and SCIEX has listened. The X500B system brings a new level of simplicity, robustness and integration to streamline the complex world of biologics characterization." SUB arose in earnest during the late 1990s when biotech companies, recognizing the widespread use of plastic packaging for blood products and medicines, began implementing polymeric containers for low-risk biomanufacturing operations like buffer preparation and hold. Startup companies developed bioprocess bags that replaced glass or larger stainless steel vessels, which subsequently gave rise to industries devoted to aseptic connectors, valves, and tubing. In fact, the greatest single-use product successes, the products with the highest market penetration, are tubing and filters, which are now almost always of the single-use variety. Plastic tubing is also used universally in stainless steel facilities, while nearly all filters are now single-use with no options for recycling. Through the early 2000s scales rose from benchtop to pilot to full-scale manufacturing, up to 2000-liter volumes. Large vendors acquiring single-use startups began to stress integration of single-use bioreactors with other unit operations, from which the then-common (and still useful) “hybrid system” buzzword emerged. Simultaneously, practical product titers particularly for monoclonal antibodies rose approximately tenfold, thereby rendering the size limitation for bioprocess bags moot for a majority of products, at least up to pilot scale. The success of SUB, and its future as an evolving manufacturing technology, stems from its near-elimination of non-value-added activities, including chromatography column packing but particularly specifically tedious, time-consuming, expensive, and highly regulated cleaning and cleaning validation of fixed-tank bioreactors and feed lines. Product cross-contamination becomes a thing of the past and threats from pathogens are greatly diminished when equipment is used once and then discarded. For single-use bioreactors the economics of use-and-toss compared with use, clean, validate, and reuse have been amply demonstrated and are now widely accepted. The rise of multi-product facilities, contract manufacturing and outsourced product development have moreover created an environment where speed and flexibility -- difficult to achieve with fixed-tank equipment -- are at a premium. Given the proven economic and operational benefits of single-use processing, several nagging questions remain for equipment vendors and end-users: How far can we go? For which unit operations is disposability still an issue? Where can we expect significant further improvements? Which process steps are hopeless causes with respect to single-use? Faster assessment of protein purity and yield. 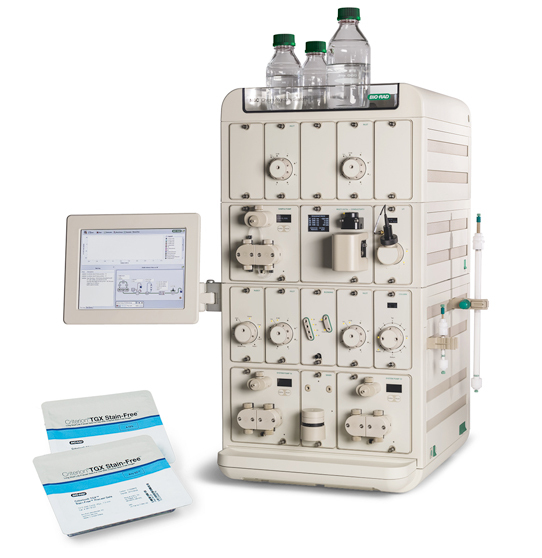 Increase reproducibility and productivity in your protein purification workflow by automating routine chromatography runs, method optimization, and multicolumn purifications using the NGC™ Chromatography System. Couple this with assessing protein purity and yield using TGX Stain-Free™ Gels to discover more in less time. Dr. Stefan Schmidt, Senior VP of Process Science and Production at Rentschler Biotechnologie (Laupheim, Germany), breaks down the operational components of single-use into cost, quality, time, and safety. One could conceive of a model where “value” takes the top rung above Schmidt’s four factors. Where fermentations last for days, cell culture takes weeks. Continuous cell culture -- an operation that relies heavily on single-use equipment -- may go on for months. Schmidt continues: “The other area for improvement are downstream unit operations. Here still not all geometries, dimensions and resins for columns are available at larger scale. Chromatography skids and tangential flow filtration devices, to name two, are also unavailable at all volumetric scales of interest.” Another area that falls short are bioprocess sensors which, in disposable formats, lack measurement ranges, precision, and robustness. While noting how some single-use applications have become routine in terms of design and adoption, Bulpin notes that “there are still areas for improvement on standardization and delivery performance for these single-use products.” MilliporeSigma has addressed this need through its Mobius® MyWay portfolio, which allows users to customize single-use systems from a component library and promises product lead times of just six weeks. Large processes built around disposable bioreactors of 2000 liters, with appropriately sized purification, buffer and media handling systems are common. Achieving larger capacities involves adding additional 2000-liter bioreactors rather than increasing bioreactor size. “If demand develops for systems that process more than 2,000 liters of cell culture fluid, innovations in single-use technologies will be required to meet the flow rates, process times, filtration device sizes, and other process parameters at this scale,” Bulpin says. Microbial fermentations have been a disappointment for proponents of disposable. Maximum oxygen transfer rates achievable in plastic bioreactors for microbial processes are limited, as is maximum achievable cooling capacity. “Also in that context, most suppliers do not share reliable scientific evidence when asked about oxygen transfer rate, or when their systems experience maximum measured oxygen uptake rates while still controlling dissolved oxygen above zero,” says Diego Schmidhalter, Ph.D., Head of Research & Technology for Microbial Biopharmaceuticals at Lonza Pharma & Biotech (Basel, Switzerland). Schmidthalter notes that “suppliers have put significant effort into the development of disposable path chromatography systems.” But, due to the high cost of purification resins, chromatography will probably be the last application where single-use catches on to any great degree. Users traditionally recondition columns and reuse, which is itself a costly, time-consuming exercise. But the nature and requirements of downstream bioprocessing, coupled with the high costs of chromatography media, have hindered single-use purification technology. A decade ago a small number of vendors floated the idea that elute-and-toss could be cost-effective in some instances even for expensive gels, like protein A affinity capture resins, which run about €15,000 per liter. This idea morphed from true single-use to “single campaign,” which extended resin use for several production runs of the same product, with cleaning between lots. Continuous chromatography, particularly variations on the simulated moving bed (SMB) idea, approach the objectives of single-use through near-full utilization of resins, therefore lower overall resin consumption. Schmidthalter also sees some potential dead ends. “Reasonably-performing single-use centrifugation is currently only available with limited capacity for mammalian bioprocessing, and disposable centrifugation for bacterial cells is out of sight.” Similarly, high-performing filtration systems are lacking for mammalian and microbial fermentations exceeding a certain biomass. Schmidthalter goes so far as to say there is “no sign of 1000-liter scale single-use bioreactors for handling high cell density microbial production of recombinant biopharmaceuticals.” Furthermore, the rigidity of currently available tubing limits achievable flows, to the point where disposable pump head technology cannot be exploited. Materials of construction for single-use materials -- leachables and extractables being worthy of separate treatment -- becomes a limiting factor for products involving more classical organic chemistry, such as antibody drug conjugates. The attraction between polymeric films and lipophilic media components such as cholesterol becomes a further limitation. Furthermore, chromatography systems with disposable flowpaths have been available for several years, and have improved with enhancements like gradient capabilities. “Automated filtration systems with disposable flowpaths are also on the market and will further enable the biomanufacturers to have end to end single-use process trains.” Examples are GE’s ReadyToProcess chromatography columns and ÄKTA ready chromatography system. Gruvegård expects continuing improvements for harvest and viral inactivation as well. GE boasts the largest standard automated single-use mixer on the market, which according to the company enables the harvest of 2000-liter bioreactor cell cultures in one single-use mixer instead of several mixers.